Technically speaking, it's still February 28 here so I still made the February deadline albeit I am late yet again. This month's theme stumped me completely as I had to come up with a Filipino dish using food with aphrodisiac properties. An aphrodisiac is a substance that increases sexual desire and in the Philippines, balut and the notorious Soup No. 5 are just examples of foods that have aphrodisiac properties. Why? I don't know. I initially wanted to do either a strawberry dessert or a fried banana dessert drizzled with chocolate and honey but I had a craving for anything cooked in gata (coconut milk) so I decided to go with prawns (an aphrodisiac) with crab fat and chilies (also an aphrodisiac) and coconut milk. This is not an everyday fare. This dish is meant to be eaten once in a blue moon. Why? Because crab fat is not exactly the healthiest of food. But since it's Happy Hearts Month, let's make our hearts and appetites happy. lol! Heat oil in a skillet or pan that is big enough to accommodate the prawns. When the oil is hot, saute ginger, onion and garlic. Saute until the onion is soft and translucent. Add the chilis and the aligue. Cook until the aligue softens and oil separates. Add coconut milk and continue to cook. Add fish sauce and lemon or calamansi to taste. Add sriracha if you want it spicier. 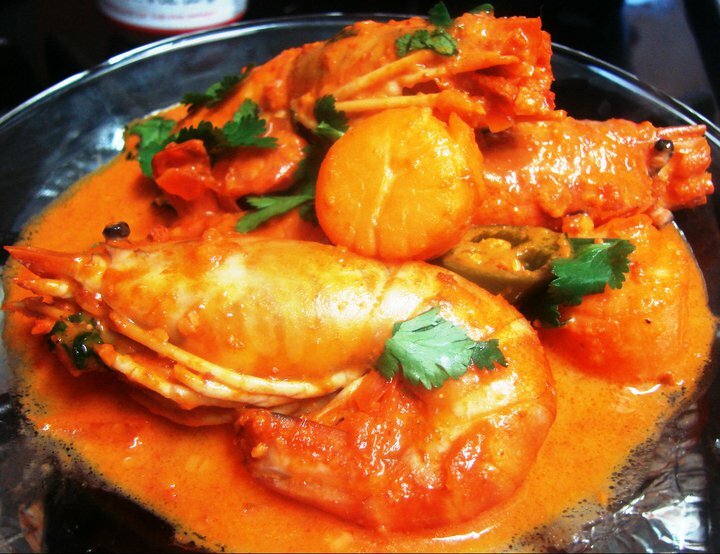 Add the prawns and remove from heat as soon as the prawns are cooked. Garnish with cilantro. you still made it... the sugpo looks heavenly. i want to eat it kamayan style.. nomnomnom! That looks so delicious! Sugpo + aligue + gata= yum!!! Love the color. Looks yummy, and I bet it tastes great! Ooooh! So wicked. It has its effects on me without even eating eat. The words crab, prawns and most especially aligue gets me excited. Love the whole dish. Like the addition of zesty calamansi. Rich and masarap! Beautiful with rice...specially the sauce, totally agree with the rest, you have to eat this kamayan style! I would eat this every single day! Great post. thanks althea & annie. i wish i had the luxury of eating crab fat everyday! Good job. it looks wonderful. My life now revolves around my son although I still have a penchant for food, traveling, books and dogs. Obsessed about building her own dream kitchen and taking that trip to Paris.